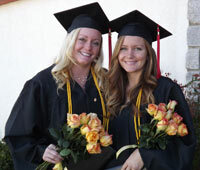 REDDING, Calif. – Siblings Summer Pansariang and Heidi Redmon celebrated together as they graduated with honors at Simpson University’s winter commencement ceremony on Jan. 21. The two sisters were among 117 graduates who earned their B.A. degree from ASPIRE, Simpson’s adult degree-completion program. Over 67 students graduated from other programs including traditional undergraduate studies, the School of Education, Master of Arts in Counseling Psychology, and A.W. Tozer Theological Seminary. Simpson holds two commencement ceremonies a year. The sisters, who both graduated with a 4.0 GPA, were eligible for Alpha Sigma Lambda, a national honor society for ASPIRE students who receive a GPA of 3.8 or higher. Growing up, the sisters’ nearly five-year age difference seemed like a lot. Pansariang moved away from home when her younger sister was entering high school, and life took them in different directions. Years later, circumstances brought them closer together. After relocating from different states to Redding, the sisters, who are both single parents of two children, found themselves at the same point in their lives: wanting to finish their college degree to fulfill a personal accomplishment, and pursue a career path that would provide stability for their family. The sisters enrolled at Simpson at the same time. Pansariang, 32, who works part-time for Comfort Keepers, and Redmon, 28, who works part-time at From the Hearth Café, chose to earn their degrees in organizational leadership, a major that offers an every-other-Saturday format, allowing them to continue working. During the 16-month program, the sisters spent most of their time together and supported each other through exams and studies. Watching them cross the stage at graduation were their four children and parents. Though the sisters share a similar career goal, they will likely use their degree in different areas. Pansariang hopes to find a job with a non-profit organization that helps women overseas, and Redmon will look for employment with a business doing good works in other countries.